Yum! I never thought I'd like these, but was always curious to try them. I am so glad I did... they are delicious! I am including TWO different recipes here: one for people on Medifast (using Medifast Puffs as breading), and one for the rest of the world (regular ingredients). Both are very good. Recipe A (Medifast friendly): crush up a bag of Parmesan Puffs into fine crumbs. I used a rolling pin and a Ziplock baggie to accomplish this. It only takes about half a bag, maybe a little more, to do one tomato. Recipe B (everyone else): Mix 2 Tbsp fine breadcrumbs with 2 Tbsp corn meal. Season to taste with sea salt and black pepper. If you want, you can add garlic powder or other seasonings to the crumbs as well. Now, take a nonstick pan and get a teaspoon of olive oil heated in there. Medium-ish heat is good, maybe a little higher (you don't want to burn your food, but want it to crisp up, so play with the temp a bit). Dip each slice of tomato into a bowl of Eggbeaters (or beaten eggs or egg whites). Then dip into the breading, coating both sides evenly. Lay the slices in the HEATED pan with the olive oil. Cook them until they are golden on the bottom (takes 4-5 minutes depending on your heat). Flip once and brown the other side. That's it, all done! The key is to get them as tender as you like without burning, so if they are not done enough for you, you can either slice them thinner or cook them on lower heat for a longer time. You can also bake these by laying the coated slices on a cookie sheet spritzed with olive oil and spritzing the tops of the tomatoes with olive oil as well (325 for 40 minutes). Crispy and good! One medium tomato, sliced yields approximately 1/2 cup cooked which equals one Medifast vegetable (Green) serving. The oil counts as a healthy fat. I have these for lunch with the rest of the uncrushed Puffs and subtract the veg from my dinner. I think these would be great with the Chili Puffs for breading as well. I love that you are always so creative with your meals!! When I saw you used cauliflower as a pizza crust I was amazed! Love your ideas!! Good question! 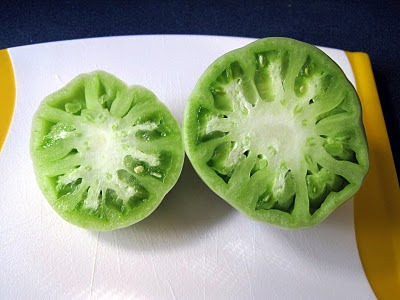 Green tomatoes are unripe tomatoes (before they turn red). So you can just pick them early, or sometimes they fall or break off accidentally and you can use them for this recipe. I do mine almost exactly the same way, except I just spray a non-stick pan with Pam. I also make a dip with non-fat yogurt and some paprika. Mmmmm! 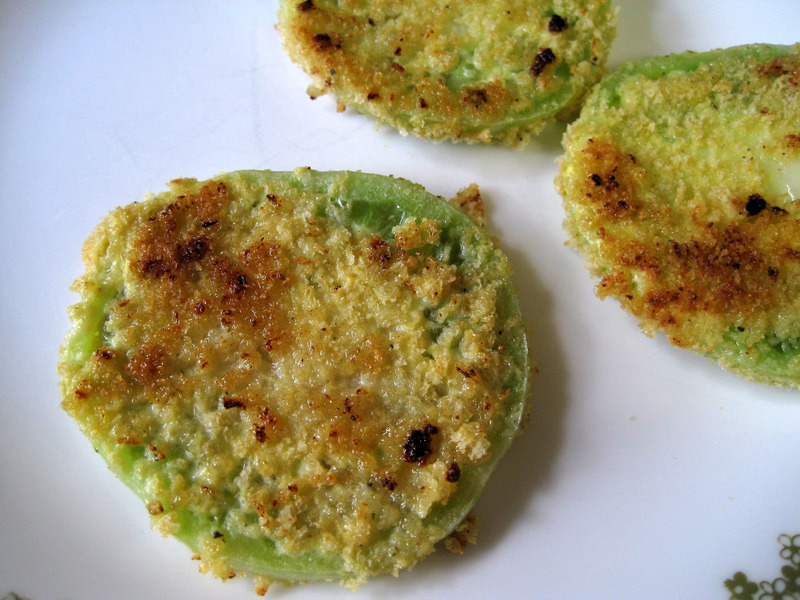 I tried fried green tomatoes 2 summers ago when I had a HUGE amount of green tomatoes on the vine the day we got our first frost. Picked them and tried all kinds of things. Gotta say... I really prefer a juicy ripe tomato. That's why we're bringing in our pots of tomatoes within the next few weeks. I have a Weight Watchers receipe that is almost the same. Except I add a little oregano to mine. They are great. Love the pictures it makes me want to cook some right now. You can also do the same with red tomato's. wow these look super yummy!!!! What are you crushing up to cook them in??? These look delicious!!! What a great way to make one of my favorite treats healthy!!! Thanks for sharing this recipe. Looks delish! You are great at coming up with stuff! 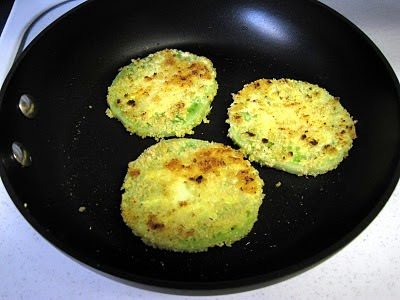 Wow, almost identical to the way I do fried green tomatoes. Except I haven't tried it with the breadcrumbs. But, as I'm thinking of baking a loaf, that can be remedied. Heaven knows, I've got a TON of HUGE green tomatoes out there on my plant and only two of them are threatening to actually ripen it's been so cool this summer. Worried the freezes will come before I get a single ripe one. So fried green tomatoes have been on my mind and I think I'll have to fix some this week. I was checking the cabinet to see if I had cornmeal only this AM!